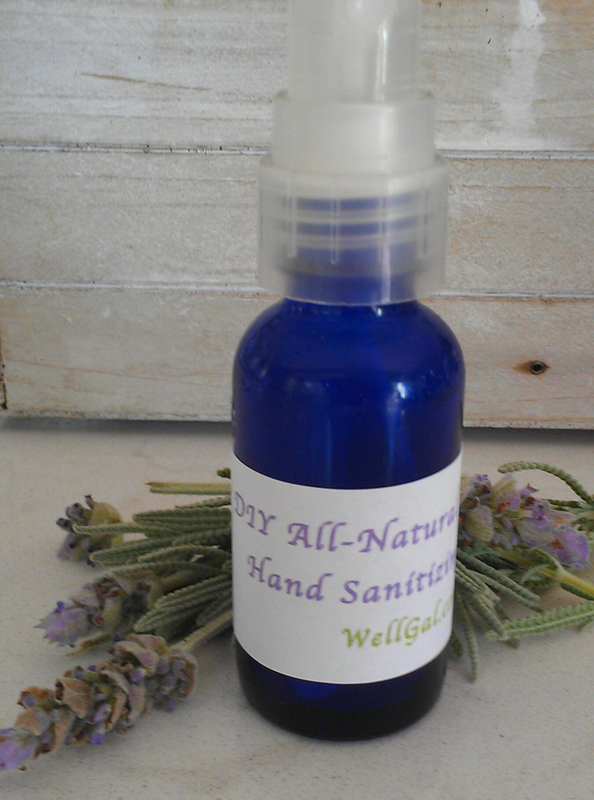 Learn how to make this all-natural and eco-friendly lavender hand sanitizer for yourself for just pennies! It makes a great gift and you can customize the scent to suit your needs. 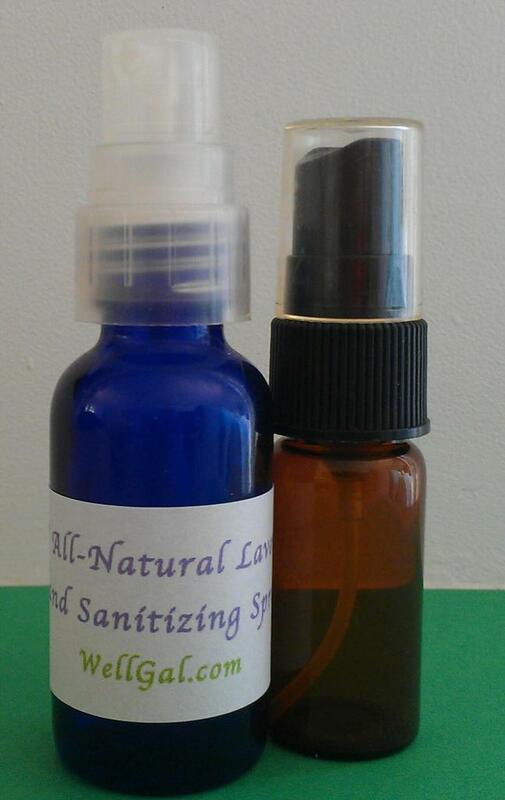 Are you in love with the natural hand sanitizing sprays on the market scented with essential oils, but not the price? I know I am. It seems that my whole family goes through bottles of EO and Dr. Bronner’s hand sanitizers almost quickly as we do tissue! And at $3.99 a pop for about 1 oz. they aren’t cheap, but they are soooo much better than the alternative — those nasty gel sanitizers made of synthetic chemicals full of ingredients that, well, really don’t seem to be that “clean” or safe for you. I got tired of laying out cash on hand sanitizers, so I got with the program and finally started making my own. It’s really easy and fast! Let me show you how to make some. All it takes is just four simple ingredients to make an effective, germ-busting, but yet gentle on the skin, hand sanitizer: vodka, lavender essential oil, water, and glycerin. Makes about 2 ounces (60 ml.) of lavender hand sanitizing spray. Now, I know what you’re thinking. You’re probably wondering why on earth I’m using vodka. Well, because it’s an alcohol, it has natural inherent antiseptic properties, so it’s fantastic at killing germs. And most vodkas are made using natural resources. Plus, vodka has lots of interesting household and personal care uses and can be used to clean so many things as I talk about in “10 Smashing Reasons to Give Vodka a Shot! (No Mixed Drinks Included).” So once you crack open a bottle, you’ll be able to use it lots of ways! The same goes for lavender essential oil. You can use it in DIY spa-at-home products (e.g., DIY Lavender Body Scrub), green cleaning recipes, and of course, for aromatherapy. It won’t be something that just sits in your cupboard. Also, lavender essential oil is great for the skin and also has antibacterial, antimicrobial, and antiseptic properties, so it’s perfect in a hand sanitizer. By the way, if you use another kind of alcohol with a stronger proof, you’re going to want to add some water so it’s not too strong. I prefer distilled water instead of plain H20 as studies have shown it to be effective for zapping pathogens as I discuss in detail in this post, “Which of These 10 Ways is the Best Way to Wash Your Produce?” But if you don’t have any on hand, then use a filtered or bottled water and as a last resort, tap water. I like adding glycerin to this recipe because it acts as a natural preservative and is a humectant, meaning it draws moisture to the skin. Therefore, it helps counteract any drying action the alcohol may have. Note: Dr. Bronner’s and EO hand sanitizers use 62% pure alcohol in their blends, so I aimed for a 60% alcohol to 40% water ratio to make sure they were effective at killing germs. 120-proof vodka is 60% alcohol and 40% water. So, if you’re using a different alcohol or vodka with a different proof, adjust the recipe accordingly. Vegetable glycerin, essential oils, and empty glass spray bottles are available at most natural grocery stores, such as Whole Foods Market, and many online retailers, such as Amazon and Mountain Rose Herbs. 1. First, you need some containers to put your natural hand sanitizer in. Because I had a few empty EO and Dr. Bronner’s bottles laying around (got a junk drawer full of ’em), I simply reused those. But I wouldn’t reuse spray bottles from synthetic hand sanitizers. Instead, I’d use some glass cobalt blue or amber spray bottles, which are often available in your local natural grocery stores next to the essential oil section. Also, before using them, wash them with warm soapy water and then sterilize them. 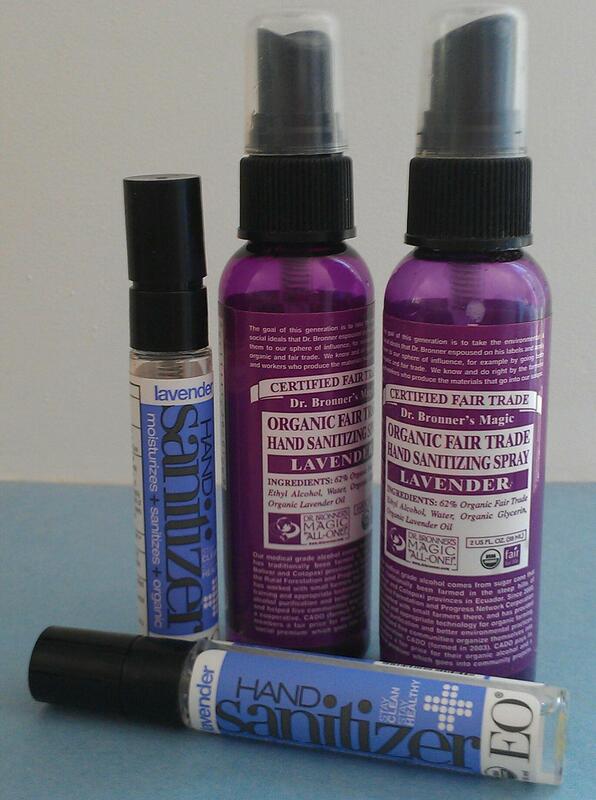 Recycle Dr. Bronner’s and EO Lavender Hand Sanitizer spray bottles to use for your own DIY natural hand sanitizers. Glass cobalt blue and amber spray bottles, which are available in many different sizes, such as 1, 2, and 4 ounces, are another option to use for your non-toxic, homemade natural hand sanitizers. 2. Pour the vodka into your hand sanitizer bottle first so that the essential oils will incorporate more easily that way. Using a small glass beaker makes measuring liquid amounts easy. 3. Add in the essential oil drops. If making the hand sanitizer for children, the elderly, or pregnant women, use 6 drops to 12 drops of essential oil (a 0.5% to 1% dilution). Otherwise, use 36 drops, which is a 3% dilution. Tip: Tap the end of the lavender essential oil bottle to get the drops to flow easily when adding them into your spray bottle. 4. If desired, add in vegetable glycerin. Play around with proportions a bit as I found that depending on how dry your hands are to start with, you may prefer more or less of it. For example, I found about 15 – 20 drops of glycerin to be perfect, but my teenage daughter found it to be too much — probably due to that youthful beautiful skin of hers! So, if you find that your hand sanitizer leaves a sticky feeling on your skin, then you added in too much glycerin. Shake, cap, and test before adding more drops to get it to your liking. Don’t overdo the vegetable glycerin or your homemade hand sanitizer may feel “sticky” and it may take much longer to dry. 5. Close tightly and shake well. Voilà! You’re done! Instead of just lavender essential oil, you can also try blending it with some other essential oils, such as orange, bergamot, or grapefruit. Peppermint is also a great option as it is naturally revitalizing. Also, I’ve seen other recipes using aloe vera gel and even aloe vera juice in place of water, which may add some more moisturizing components to the recipe. However, since Dr. Bronner’s hand sanitizer uses just alcohol, water, glycerin, and essential oil, I stuck with the basics for the above recipe. I put off making my own hand sanitizer for quite some time (even though I knew how to do it. I know, excuses, excuses! ), but once I made it part of a routine, such as when I make my kids lunches, I found it easier to incorporate. It also made sense to do it that way since they carry hand sanitizer to school with them. In addition, I found making a big batch of this recipe and storing the remainder in a tightly lidded glass container, made frequent refills so much easier. Also, storing the ingredients in my kitchen cupboard for easy access made a huge difference. Note: The above recipe was updated July of 2015. Previous measurements [i.e., 1 ounce + 1¼ teaspoons (36 ml.) of vodka + 4¾ teaspoons (24 milliliters) of water] were erroneously based on the assumption that most vodkas were close to 100% alcohol. So, if you do use a vodka with a different proof, adjust accordingly. Copyright © Karen Peltier and Well Gal, 2014 – 2016. All rights reserved. Photos © Karen Peltier and Well Gal, 2014 – 2016. ← Looking for Eco-Friendly Solutions for Packing Lunches? I just did it and it’s very good! I love the texture and the smell. Thank you! 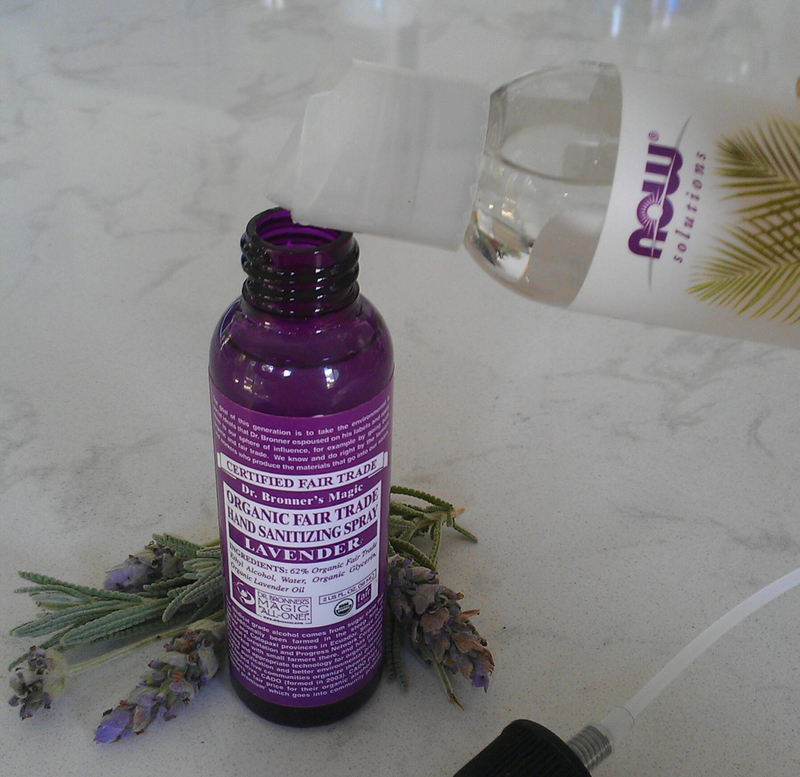 The spray piece.. and as an extra bonus if you are stranded and need more than just the scent of lavender; you can drink it!! Hi instead of vodka can I substitute it with drug store rubbing alcohol? Rubbing alcohol has poisonous chemicals added to it so you can’t consume it. I’m not sure having it in a fine-spray form would be a good idea due to the fact it can be poisonous when inhaled. So, I’d stick with vodka. It’s much safer. Great recipe… remember that vodka is already a mix of water and alcohol. So a 100 proof bottle of alcohol is 50% water. Dr. Bronner’s is 62% alcohol, so you may want to skip adding any additional water to your formula! Thanks for pointing out how a 100-proof bottle of vodka is already half water. Great catch! So you are right that using pure vodka may be all that is needed to get something similar in strength to the Dr. Bronner’s formula, which definitely will zap those germs dead. Many aromatherapists use witch hazel in their sprays, which of course just has a fraction of alcohol in it, so I think it comes down to what you personally feel comfortable with. I love Dr. Bronner’s hand sanitizer and was so excited to find your recipe. I could only find 151 proof vodka so I diluted it with distilled water. I found a fabulous website that tells you the exact dilution amount to add to make it a 60/40 dilution.The link is below. How wonderfully resourceful you are! My wife loves the smell of lavender. She uses lavender oil in her hair. Maybe there is a way to make your own hair treatment as well with home ingredients? I’m sure there would be a lot of people interested in that! Great read and instructions! Brandon Turner recently posted…Lost Your Keys to Success? Take Mine! There are definitely nice ways to make your own hair treatments with natural ingredients…You just gave me a good post idea. Thanks! I do love the bottles you use, I wonder if we can get similar ones in the UK? Hi Sarah. I would definitely think that you should be able to find small aromatherapy spray bottles in the UK, especially since aromatherapy is much more embraced there as a complementary therapy than in the U.S. If you do find bottles, please let me know where you found them as I’m sure other UK readers would like to know. Lavender makes the whole thing worthwhile, the scent is so great.. I love it. Thanks again, so much for sharing. nick catricala recently posted…How do you handle conflicts in life and business? Glad you enjoyed the recipe! 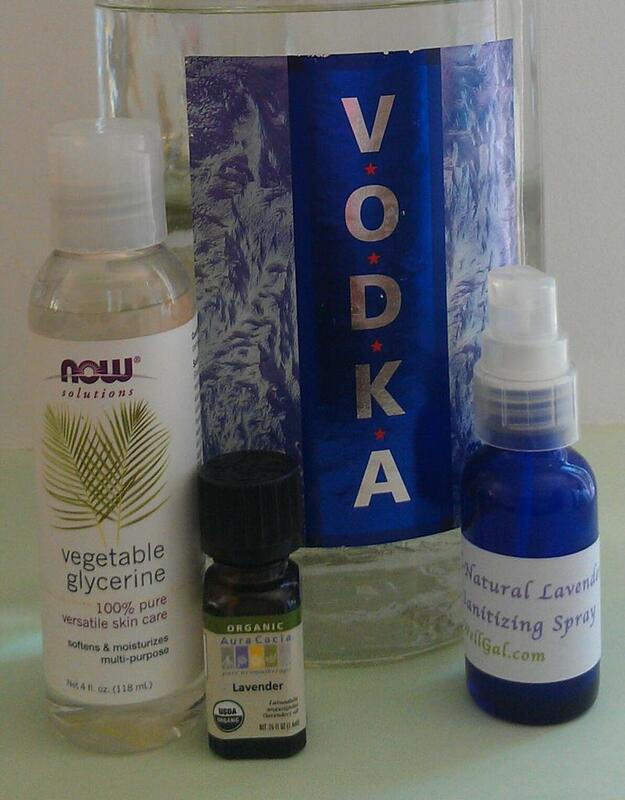 I don’t drink vodka, but only use it for cleaning, herbal tinctures, and of course, in hand sanitizing sprays. 🙂 You mention you’d replace the vodka with pure alcohol. I’m curious. What kind would you use? I’m not familiar with Everclear and perhaps other readers aren’t, so I Googled it. It’s a corn-based alcohol with two proofs available — 151 and 190-proof, though perhaps not in every state according to Wikipedia. So, you may need to tweak the alcohol/water ratio depending on which proof you use. Let me know if you give it a try! Due to the fact that my religion forbids the use of alcohol .What could I use instead of alcohol in the recipe? Hi Zaheda. Some aromatherapists use a couple drops of pure lavender essential oil all by itself as a natural hand sanitizer, which of course is super simple! So you may wish to try than as an option for an alcohol-free hand sanitizer. I have all the ingredients to make this hand sanitizer. If it wasn’t for recent visitors at my home, I would have to get the vodka…which I never drink! But a good thing I saved half that bottle for a rainy day! I wrote down the ingredients and am looking forward to make it myself. I love working with essential oils. And Lavender is one of my favorites…I put a few drops in the bath all the time to relax. Thanks so much…I rather DIY than purchase something I need to hunt down. Wonderful! Sounds like you’re all set to make yourself some hand sanitizer thanks to your recent visitors who made sure you’ve got some vodka on hand! I tend to just wash my hands. If I don’t have a sink to wash them in, then I don’t eat or do anything with dirty hands unless I have soap and water. Most sanitizers irritate me. However, my sister loves this type of stuff so I’ll be sending her a link to this. I’m absolutely on board with washing one’s hands instead of using hand sanitizer if there’s soap and water nearby! Studies have shown that proper washing with soap and water does a very effective job at removing germs and dirt. So, for me, I tend to use my hand sanitizing spray when I can’t wash my hands, such as when I’m in the car. I also find it useful for general disinfecting. For example, I’ve used some on a napkin to wipe down my phone or computer keyboard and have even used it while traveling to disinfect those pull-down trays on airplanes. I love the scent of lavender also, this sounds great, and easy to make! I wouldn’t tell your friends about this Karen, or you’ll end up in making it for everyone else as well. 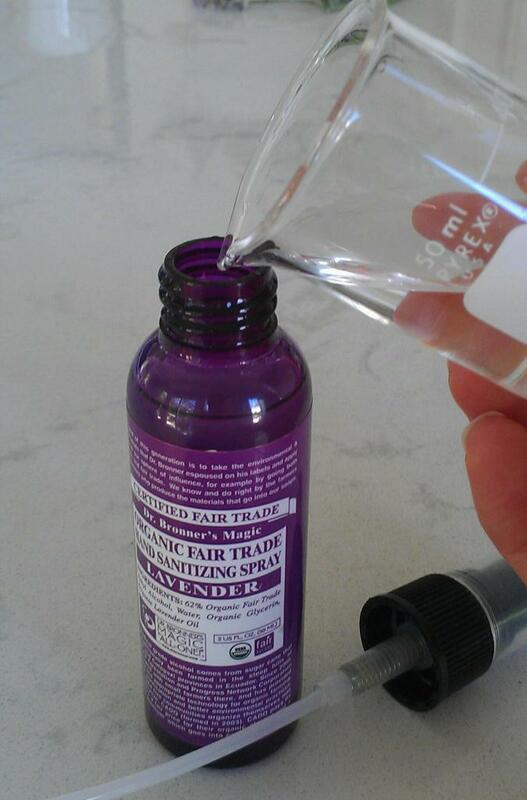 I’m lucky in that I haven’t gotten an overwhelming number of “orders” from friends for this DIY lavender hand sanitizing spray! But, you know, it would be fun to make a large batch for the holidays coming up and give them away. They’d make great hostess gifts, stocking stuffers, etc….Oh my! Here I am talking about the holidays like the big brand names stores do and it’s not even the end of September! Oh this sounds marvelous and I just love the scent of lavender. Thanks so much also for showing where the ingredients can be purchased. I’m glad to see most of them can be ordered online because I live on an Island and while we have the basics anything out of the everyday norm almost always has to be shipped in. Hi Marquita. It really is so much nicer than the “standard” hand sanitizers on the market. I love the scent of lavender, too. It has a calming effect, so I love to use it when I’m on the go or having a particularly stressful day. Also, I’m glad you noticed how most of the ingredients can easily be purchased on-line (the vodka might be tougher! ), so hopefully you can get a hold of what you need if they aren’t available at your local store. I work in the medical field and definitely use a lot of hand sanitizer. This is a pretty cool DIY set of instructions. I never thought about making my own hand sanitizer. I get a kick out of that because I am all for saving money. Thanks for sharing. Hi Nathaniel. This definitely will save you money! I haven’t done the math to determine how many bottles of hand sanitizer you can make with one bottle of vodka, some essential oil, and water but I’m sure it’s dozens if not over a hundred. Thanks for taking the time to leave a comment.